Food Bazaar must not be too concerned about shoplifting even though it's not the best area late at night. However, the store is open 24 hours and there's always security on site, 24/7. Also, look a little closer at what's holding up the display and the mums...yes, those are old Pathmark produce cases! Photos from my 10/7/17 visit. Probably the most controversial, mysterious, and just plain old weird supermarket chain in the New York City area is Western Beef. Run by the son of an alleged Gambino crime family member, Western Beef was officially cleared of any possible Mafia ties in 1995, and the company shut down its wholesale operations at the same time (where some claimed the Mafia links were most prominent). You can read more about the interesting history of the company here. The East Orange, NJ Western Beef location was opened in 1985. It was Western Beef's third location, following stores in Flushing, Queens, NY and Spring Valley, NY (presumably where the Food Fair is today). Store #004 was in Union, NJ, although I have no idea where. The large, cartoony signage is reminiscent of South of the Border or other such attractions. In fact, looking at it from the outside, Western Beef looks like one of those tourist destinations -- past its prime but still hanging on. Actually, Western Beef does a very good business and is in fact in the process of expanding. Its parent company, Cactus Holdings, is announcing the introduction of several new banners, including the smaller Western Beef Market, the Delicioso Carniceria, the Farm Fresh Market, and the 1906 Artisanal Butcher Shop. I'd driven past this orange building for over 10 years on I-280, which runs on the other side of the store from New Main St (here), but didn't go in until October 15, 2017. The building itself is probably a converted warehouse or factory of some kind. This part may have been open at one point. The door seen open here actually leads down a hallway to a laundromat that shares the building. The supermarket's entrance is to my right above. Here you can see Charlie Catcus, Western Beef's mascot. Western Beef, being a value warehouse store, does not so much focus on its appearance. What it lacks in ambiance, it makes up for in prices. The produce department was small but well-stocked with very fresh produce and all the essentials. The windows we see to the right here look towards New Main St, but notice that there are actually two sets. The first set look from produce to the laundromat hallway, then the second set is on the outside of the building. Looking towards the parking lot. Now those are some old -- and orange -- produce cases! Refrigerated produce is on the wall farthest from the parking lot. These cases may be newer. Moving towards the pass-through to grocery. It's behind me to my right in the photo above. This area has such low ceilings because there are managers' offices on the second floor. Looking towards grocery, the doorway to which is right behind the .59 sign. A doorway to the backroom and possibly basement is to the left above. Check out some of these "West Indian Herbs" they had along the side wall! Now that's a specialized product, and really knowing your target market! You enter grocery through the doorway under the Western Beef logo. The aisles run to my right, with checkouts to my left. And you can't fool anyone, Charlie, we all know you're not Abe Lincoln. Even with the beard. The aisles are wide and fully stocked, and most importantly, clean. The flooring throughout the store was a little patchy, but spotless. I love clean grocery stores, so big credit to Western Beef here. If the shelving looks familiar, it is. Universal in Rahway used to be a Western Beef and retains many of its Western Beef fixtures and some of the decor. However, this store was much cleaner and better-maintained than Universal. As a value-based store, Western Beef places a major emphasis on its own storebrands. Through their subsidiary Millennium Food Group, they produce the Western Beef, Farm Fresh, 1906 (meat/deli), Delicioso (ethnic), Blu (water), Kotton (paper products), and Uncle Joe's (Italian) brands, among others. They also buy wholesale from Supervalu for Essential Everyday and Wild Harvest products. Along the back wall is Western Beef's version of the Wall of Values, with a doorway on either end to enter the meat/seafood/dairy room. And yes, the meat/seafood/dairy room is refrigerated. These cases here are actually freezer cases for meat within the refrigerator room. Dairy is along the wall that borders the regular store. All the meat and dairy is out on shelves, which is just strange. Until you realize you're wearing shorts and a t-shirt in a 35-degree room. Service butcher along the back wall. The seafood counter, which is actually an independently-run business, is in the back corner of the refrigerator room, where the fish is out on ice. Seems to me the ice is a little unnecessary. Heading back outside, the store actually felt hot. The last aisle is frozen foods. This small case for rolls and bread on the left makes up the store's entire bakery department. And the freezer cases are quite old, but they all seem to work just fine. Look how clean that floor is! The small front-end. Only two registers were open (which you couldn't tell because there are no register lights on anyway). The line stretched from register 3 to where I'm standing, to the right of the photo. Western Beef is known for keeping too few registers open, so this wasn't necessarily surprising. The experience was great until it came to checkout. Luckily, the lines were moving very quickly. Earlier, when I was in the produce department, a manager who was walking by smiled and greeted me (I was the only customer in produce at the time). This was, however, canceled out by my cashier, who didn't say two words to me. And I love that sign high up on the wall -- "Please ask for help". Not with anything in particular, just in general! Customer service empty, but fully stocked with HABA. I'm putting this photo here again, to show the location of the exit. You leave the store under where the word "Thank" would be on the orange sign, and make a 90-degree turn to the left to exit towards the parking lot. Western Beef is just a little weird. I really liked the prices, and the fact that it wasn't quite a discount store -- the produce was pretty good, there is service meat and seafood -- but with the prices of a discount store. This store, which is only 11,000 square feet according to Cactus Holdings (I find that hard to believe, I would estimate more like 30,000 SF), is small, so selection is limited. And be prepared to wait. But say hi to Charlie if you visit! But we don't know what yet. The Crossroads Companies have announced a transit-centered development in downtown Dunellen to be anchored by a large supermarket (size unspecified). Love the competition map on the second page -- still lists A&P and Pathmark alongside the brand-new South Plainfield ShopRite, still has the old Stop & Shop logo, and forgoes the correct Tropical Supermarket logo for that of the Florida chain Sabor Tropical. Does anyone else feel like there are more and more little, not-quite-bodega markets around in the cities or is it just that I'm only now aware of them? I don't mean true bodegas, I mean more like super carnicerias that have produce, a little deli, maybe 3-4 aisles of groceries, and a huge meat counter in the back. I always feel like they're better for a neighborhood than a convenience store, because they sell fresh meat and produce. 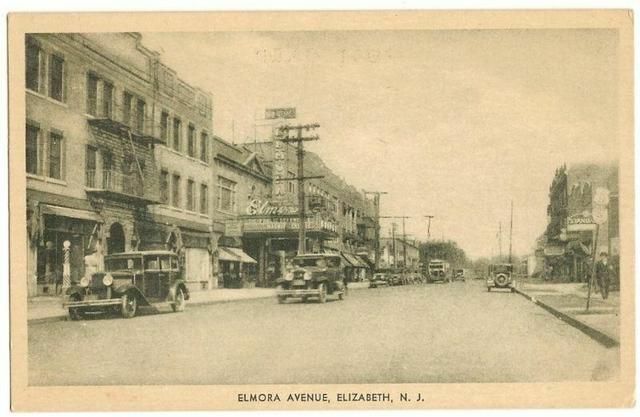 Both my parents grew up in the Elmora section of Elizabeth. My father worked at the Mayfair Foodtown, which is now partially the Elmora Farmers' Market. (Ironically, his family shopped invariably at the Pathmark, which is now Food Bazaar.) Their parents, mostly, always went to Jaspan Brothers Hardware, always called Jaspan's. A really old-fashioned friendly neighborhood hardware store, Jaspan's lasted until 2009 when the owner, Mr. Jaspan, retired and moved away. Jaspan's was a True Value store. 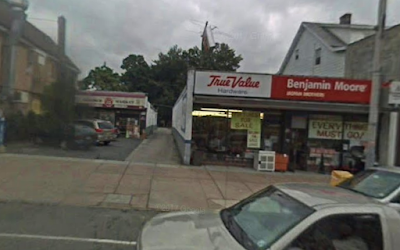 Here we see it in liquidation in September 2009, courtesy of Google Maps street view. 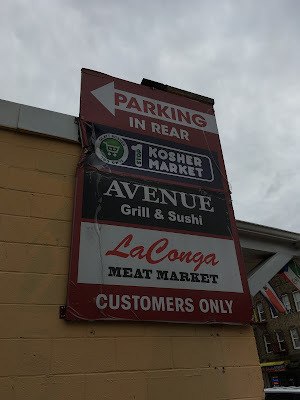 Jaspan's had parking in the back, which it shared with this little Kosher grocery store (set back on the left). Elmora used to be a highly Jewish area, which has given way to mainly Portuguese and more recently, Latino residents. (The nearby ShopRite, built in 1994, had a Kosher meat department when it opened, which closed recently.) There's even a Kosher Chinese restaurant on Elmora Ave. Anyway, Jaspan's was gutted and taken over by the independent Econo Super Carniceria, which barely lasted at all. 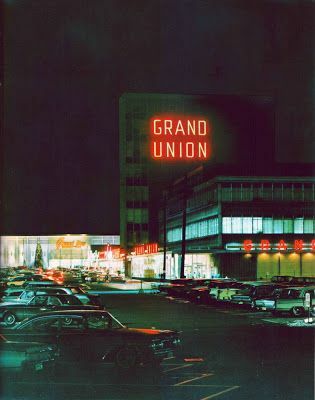 Soon thereafter it was bought by La Conga, an independent supermarket in Jersey City, and reopened as La Conga II. La Conga II didn't last either and the store most recently has been switched to International Supermarket. 2. omits Avenue Grill & Sushi (a Kosher restaurant), which also shares the parking lot. This might be an entrance in the back, but we're going to head around front to go in. The red and white building to the right is the One-Stop Kosher Market. Great view of the old Elmora Theater straight through from the driveway. The Kosher market next to International, closed on Saturdays. The building to the left here contains Avenue Grill & Sushi, owned by the same people as the market. This sign on the side of International's building still lists the grocery store as "La Conga Meat Market", gone for over a year at this point. The sign really is the La Conga sign with the "La Conga" lettering scraped off and replaced with International, which makes me wonder if it's actually the same owners. Checkouts in the front. You can see the front edge of the deli case to the right. Meat along the back wall. The butcher counter takes up the entire back wall. The middle grocery aisle looking towards the front of the store. As a side note, International uses several storebrands, including Krasdale, Parade, and Better Valu. The meticulously-organized produce case in the front. Every item was beautifully displayed, especially the scallions which were in bunches as carefully done as bouquets of flowers, and each was perfectly vertical. I think in a small, low-volume store like this the staff must spend all their time organizing it. And it certainly shows: International was much cleaner and neater than most inner-city "super carnicerias". Also notice the flooring - the patch in the middle makes me wonder if one of the prior tenants had extended the aisles to the front and maybe just used customer service as a checkout. As usual, no, I was not driving. Get really for a really different store tour on Monday!